Springtime brings new birds to our backyard. The boys love watching the birds -- and the pesky squirrels-- play on a tree outside the kitchen. We've been studying birds and one of our favorite books is "Birds" by Kevin Henkes. We've been observing and recording birds, sorting bird feathers, and even painting with bird feathers. In this story, a girl wakes up to hear birds singing. As she goes through her day, she observes and comments on features of birds. She wonders aloud about birds. She tries to mimic the flight of birds. In the end, she discovers the one thing she can do that birds can also do. 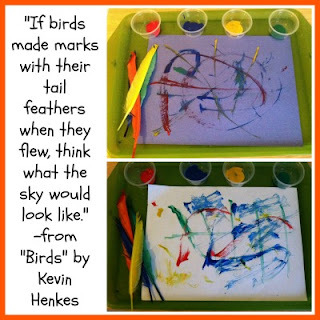 The illustrations and the simple text of Kevin Henke's "Birds" makes it a wonderful choice for preschool children. There are many preschool concepts covered in the book- colors, numbers, ordering objects by size. Also, in the book there are many "I wonder" questions that promote problem solving and creative thinking like, "If I were a bird, I'd ask where all the other birds go when it's stormy and they can't get home to their nests". In the story, there are birds of all colors. We have many birds visit our bird feeder each day and I thought it would be fun for the boys to try and graph the colors of birds they observed. 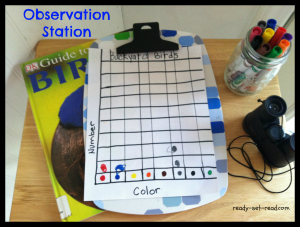 I made a simple chart for them and posted it near the windows that overlook the bird feeder. The book covers birds of different colors and birds of every size. I bought a bag of colored feathers from Walmart. We sorted the feathers by color. I planned to order feathers from largest to smallest, but all of the feathers in the bag were roughly the same size. We also worked on building and extending patterns with feathers. We wanted to try and experience what the sky might look like if it were painted with feathers. 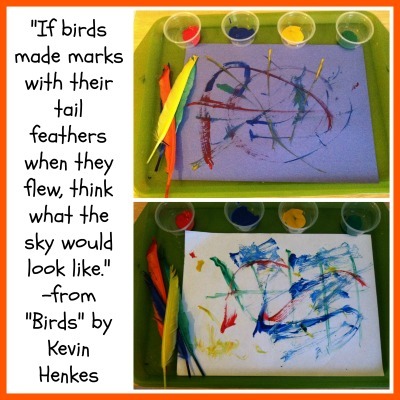 We used some feathers to paint a colorful sky picture. Each day on facebook, I share a picture book of the day that is recommended by myself or a handful of other kidlit bloggers. 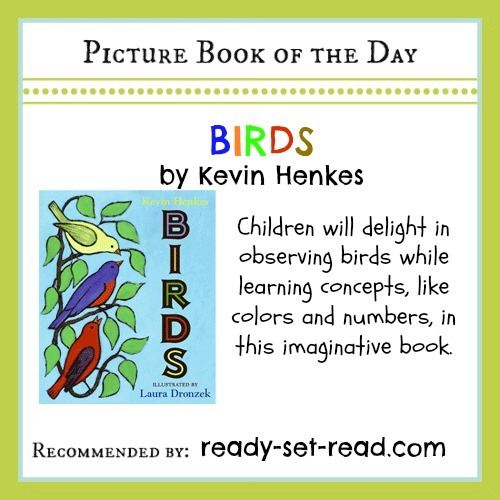 Birds by Kevin Henkes is my picture book recommendation of the day. Like my facebook page to get daily book recommendations! What a great idea! I love your site! Its so cute!! We love Kevin Henkes, but I had not seen this book. I can't wait to read it and do these fun activities! It was actually new to us this spring as well. I don't know how I had missed it before because it is now one of my favorite Henkes books! Thanks, Misty for stopping by! Love these activities! We love Birds here too! I love the bird tally sheet. He loves to watch the birds in our yard. I so need to make him one.